Carries heavy loads, up to 1,200 lbs. Top shelf is designed to retract to allow more space for larger items. 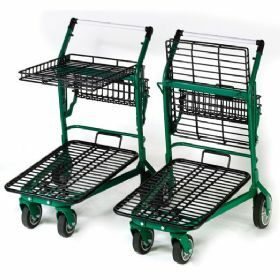 This rugged cart is made for rough terrain usage with oversized 8" rear and 6" front wheels. Available in Dark Grey/Black or Green/Black - please specify color. Ships UPS. FOB Shipping Point. Product No. Size L x W x H Wt. (lbs.) Price Ea.